Heat 2Tbspns oil in a kadai and fry rai,methi and maash ki dal for a minute. Now add tomato and baigan cut to small pieces.also add green chillies,turmeric powder and salt. Cook till Baigan and tomato become a little tender.Finally add coriander leaves. Grind to paste with tamarind.Keep aside. 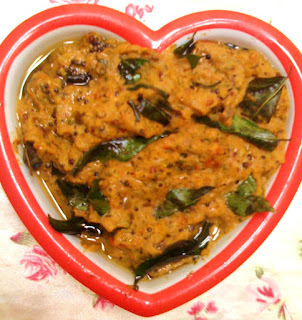 Heat little oil abt 4Tspns add mustard seeds and curry leaves,fry till the curry leaves become a little crispy,Add this to the baigan paste. Combination: Tala hua Gosht ,Idly. Anjum, I usually prepare Baingan ka bharta, chutney style. But I am sure gonna try your Mami's recipe, Jazakallahu Khair for sharing! Looks very yummy!! Heyy, was jus checking , thot 2 say a hiiii...i c u hav updated ur profile...gud...waise u doing a gr8 job here....keep it up bhabz.....u r d best....lovvve u ! I've never heard of baigan ki chutny.I'll try it out very soon and will let you know. Eid Mubarak to you an your family Anjum. Long time no new post jaldi kuch post kariye. Anjum, I tried the recipe and it was superb! Jazakallahu Khair for sharing! Eggplant is delicious so many ways, this looks awesome! Delicious! I can't get enough of spicy, savory eggplant! What do you call mash ki daal in english? Or can you put some photos of the same? I tried this and it tasted so good. For all those who are hestitating trying this chutney....Dont be......u will love it...even if u dont like brinjal/egg plant...try it..u will not know whether it has this vegetable or not. in fact a fаstidious post, kеeρ it up.